Sign up for Broadjam today to follow Jon Wheatley, and be notified when they upload new stuff or update their news! My name is Jon Wheatley I am 27 yrs old, originally from Joliet, Il. 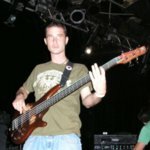 Moved out to Hollywood, Ca when I was 20 yrs I went to Musicians Institute and graduated their Bass and Recording programs in 2006. Since then I've playing in bands and recording my songs! Summer Daze - very Red Hot Chili Peppers; cool. The mix and production need to be better, but I'm sure I don't need to tell you, that; this is a Polaroid, not a portrait. With that said, Jon, this is a very cool tune. I really like your vocal (if it's you). It's very laid back, very in the pocket and relaxed. Near the end of the song, everything get a little out of time; drums ahead of everything, but I'm sure you know that, as well. It's a charming song; your bass (assuming that's you) is great! Keep plucking away, my man; it's a catchy little piece.